Ya’ll know I love some planning! Anyone love a good planner as much as I do? I bought and used every. single. one. of the planners to complete this project. Why, you might ask, would I do such a thing? Because I am obsessed with personal development, time management, planning, happiness, fulfillment, and success. I wanted to see what the pros are using and what the best products are on the market for planning and journaling. Also, these planners and journals are all physical products you order. If you’re interested in a digital product, check out Dream Year – it’s my goal setting workbook I created for a digital goal setting book and planner. Side note – I added more journals at the end that people have recommended to me to keep the list going, but I didn’t review them in detail. First up is The Five Minute Journal! Here’s a look at how this gratitude journal works. A journal that uses positive psychology to help you be more mindful through practicing gratitude and planning and evaluating your days. The planner begins with an overview of how to use it and why it’s so important to use. Each page of the planner is one day (undated, for you to fill in the date) and split between a morning entry and evening entry. The morning entry has a space for you to list what you’re grateful for, what would make that day great, and daily affirmations. The evening space is created for you to list three amazing things that happened that day and how that day could’ve been better. This planner is very aesthetically pleasing. It’s small, soft to the touch (linen), and lays flat when you open it. Created by Alex Ikonn and UJ Ramdas, two online entrepreneurs who have big platforms. Anyone who wants to practice gratitude on a daily basis without having to spend a lot of time doing it. Anyone who wants to journal but thinks she doesn’t have the time for it. Anyone who cares about learning and personal growth as a life practice. This isn’t a planner. It’s a journal. It will help you live with intention through practicing gratitude and slowly implementing positive habits into your life. But it’s not going to help you remember your day-to-day activities or goals that you have planner. As long as you know that going into it and set the appropriate expectations, then you’re good to go. This journal is very structured so if you want a lot of blank space to write what you’re grateful for, you won’t find it here. This journal was made specifically to use quickly every day, so there’s not room for long sentences and deeper, longer reflection. The planner is only for half a year. So, while the price seems low, if you want to continue using it forever, you’re paying double what the price is for one year (which is what most planners or journals have space for). Download The Five Minute Journal Quick Start PDF for free to get started. Buy The Five Minute Journal here. This journal is amazing. It’s so easy to use. It helps me reflect on my days. It’s a great way to evaluate how life is going, in a short amount of time. The way the journal is set up makes it easy to use. The beginning of the journal has pages dedicated to reviewing how to use it, which is helpful. This journal would make a fantastic gift. I was gifted this journal by Miriam, and to pay it forward, I gifted one to Tyler, who now uses it, too. I am using this planner daily. Next up is the Productivity Planner. Here’s a peak into how it works. This is a planner that helps you manage your daily tasks and improve your productivity and success. This planner helps you prioritize and accomplish the most important tasks that make your day satisfying. It assists you to get better work done in less time (quality over quantity). The planner is begins with an overview of the planner and how to use it, with examples (because it’s not intuitive). A weekly planning page at the beginning of each week for you to write out your most important weekly tasks. Daily pages for you to put the date at the top, followed by important tasks, secondary tasks, additional tasks, and notes. Weekly notes, which is a full page of lined space for you to make notes to yourself. Weekly review for you to list out your wins, what you did not complete, what you learned, and a space for what’s for next week. Productivity score for you to rate your day’s productivity, knowing what a “ten” would be. This planner is very aesthetically pleasing. It’s small, leather bound, and lays flat when you open it. Created by the same guys from #1, Alex Ikonn and UJ Ramdas (two online entrepreneurs). Anyone who is achievement oriented and career driven. Anyone who struggles with doing a million things at once. Anyone who wants to accomplish more and be more successful. Anyone who cares about her career and productivity. It is strictly a daily and weekly planner. There is no monthly planning. So, I still use this planner with my gCalendar, where I plan out my months. The individual pages within the weeks are only meant for M-F, so there are only five days of weekly planning. Download the Productivity Planner Quick Start PDF for free here. Buy the Productivity Planner here. I was excited about this planner, but it exceeded anything I could’ve imagined. It wasn’t that when I got it and opened it that I immediately felt like “this is the one” but it was after using it for a week that I realized how much I needed this planner and how much it was benefiting my life. I recommend this planner for everyone. It forces you to prioritize your life. It increases your productivity and forces you to make choices you might not otherwise make. If I could afford it, I would give this planner to everyone I know as a gift. I am using this planner daily! The Living Well Spending Less planner is the third planner I reviewed. Here’s what I found out about it! A planner designed to incorporate goal setting with daily task management. This planner is aesthetically very bright and bold. It’s medium-sized and a bit heavy. It’s spiral bound and easy to keep open and use. This journal is by Ruth Soukup, the founder of Living Well Spending Less, a blog for moms about making home life better by saving money and focusing on family. Anyone who follows Ruth’s blog and loves her stuff. If that’s you, you will love this planner. It’s completely in line with her brand and her mission of organizing and simplifying. Anyone who needs a way to organize her home. I think it would be great for a wife, mom of a few kids, and owner of a home who needs to keep the entire household organized. Anyone who wants to combine her long-term goals with her weekly lists in one place. 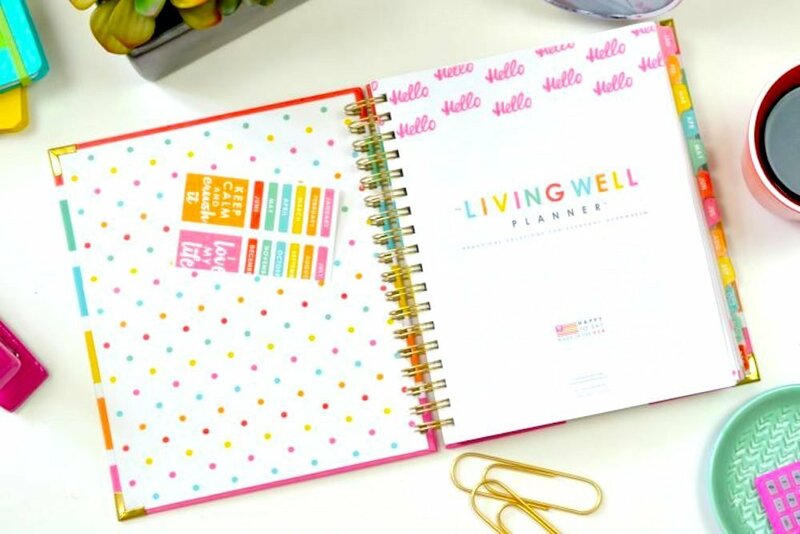 Anyone who wants more than just an everyday planner, and instead wants a planner that can help her create a life plan. The price. It’s the highest priced planner on this list. I have to admit I had a bit of sticker shock with it. Although, I was not disappointed with what I got for that price. Ruth delivers with this planner, so at least there’s that. If you don’t like a bigger sized planner, you may not love this one. It’s not huge, but it’s big enough that it’s not something I would carry in my purse. It’s also very bright colors (like her brand), so if you don’t want a rainbow planner, this isn’t for you. The weeks start on Mondays, so some people will find that a downside. Only on Ruth’s website in her shop. I think people who follow Ruth will love this planner. It is more targeted for people who are running a household. I imagine this planner on a workstation of the side of a kitchen in a big home. This planner is very structured and organized, and I think it would be very useful for the right person. I’m not using this planner daily. The Law of Attraction Planner is fourth on deck — here’s a look! A planner that’s designed to help you live your dream life. It’s really a life planner applied to a 12-month calendar year. 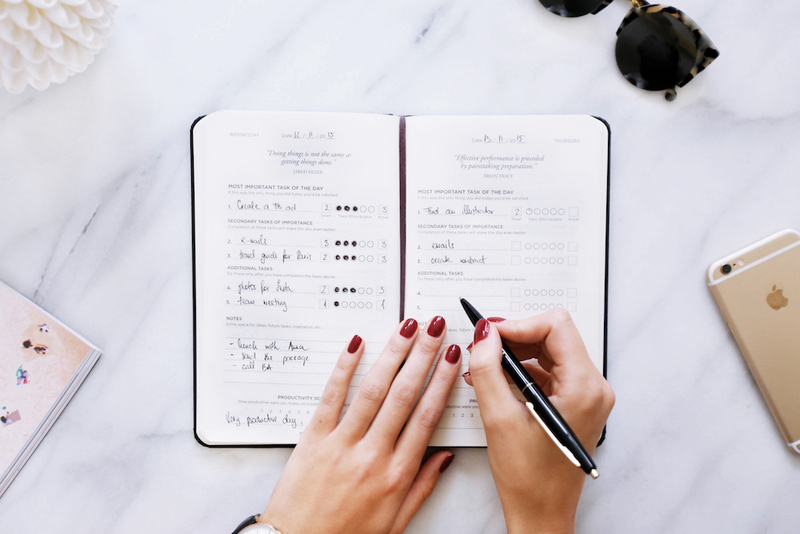 This planner aims to helping you put a life plan into action through intentional life planning in each area of your life. It teaches you how to integrate goals into your daily life, have greater focus, be more grateful, and more. There are many sections in the beginning to help you get organized, followed by un-dated pages for each month where you can plan your days. There’s a notes section behind each month, too. This is the personal development guru’s dream planner. 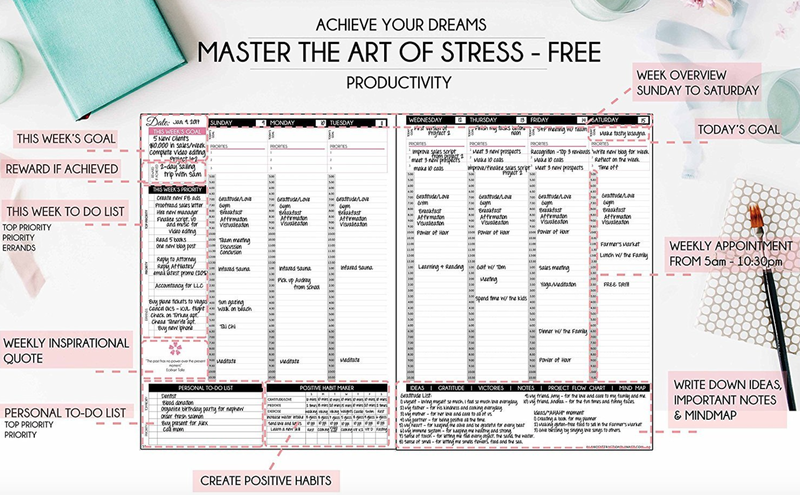 This planner is by Freedom Mastery, which is run by a personal development guru and entrepreneur. Anyone who is super intentional (or wants to be super intentional) about her life. This planner is something that you need to make time for. 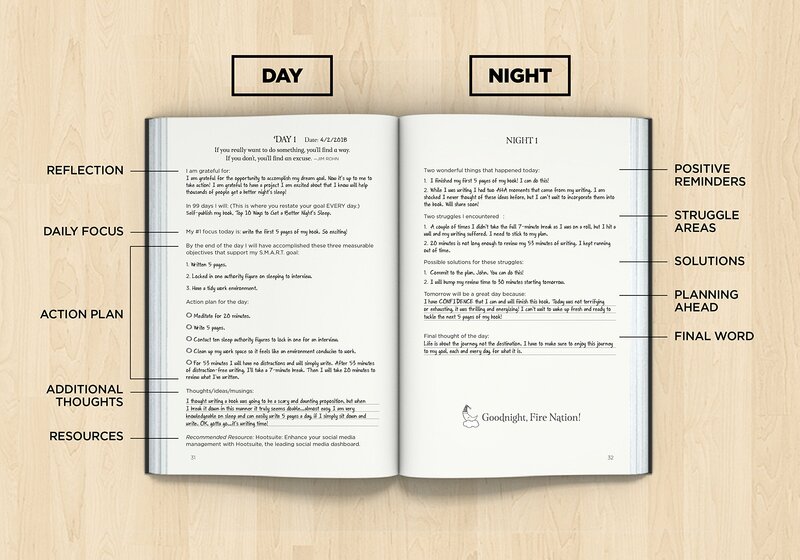 You probably need to spend close to 25 minutes in the morning and evening with this planner. It’s not intuitive, so it requires commitment. That said, the reward of actually following through and accomplishing your goals is worth it. You just have to be willing to commit. The sales page is super spammy looking and hard to figure out. While this is a downside, you only have to figure it out once and shouldn’t deter from buying the planner. This planner is really great. I am using this planner as a “life planner”. The only downside is that I can’t see anyone using this who isn’t super motivated and driven. It’s not something to squeeze in. You really have to be committed to using it. The Happy Planner is the fifth planner I took a shot at and here’s what I found! It comes in a wide variety of designs, with different color schemes and quotes. The target audience is definitely female. The planner is broken up into sections, with tabs stating the months on them. Within each tab is a two-page spread of 30-31 day month layout, followed by several columns on each page, with the dates across the top. At the very end of the section, there is one page for any notes, important dates, or birthdays to remember for the month. 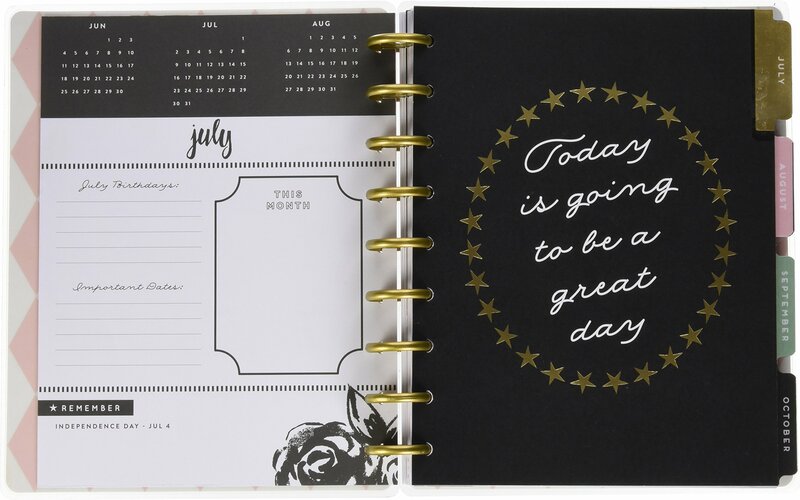 This planner is very pretty, wired-bound, and easy to keep open and use. It’s a bit on the heavy side and is medium-sized. This planner is by Me and My BIG Ideas. This is an online brand that has done a lot to build a platform online, specifically on Instagram. Anyone who wants to use a pretty, every day planner and nothing else (no goal-setting, weekly planning, or practicing gratitude). It is just a planner. There are no added sections for goal-setting, life-planning or practicing gratitude. You won’t learn how to be more productive or how to practice gratitude or how to accomplish your goals. You simply will have blank spaces to write down your tasks every day in a very pretty space. The sections are labeled with the dates, so you need to buy this planner for a January or July start. Amazon for sure (and potentially other shops, too). I was really excited to get this planner because it looked so fun from the pictures and descriptions. However, I didn’t realize it was going to be just a planner. There isn’t anything additional to gain from this planner in terms of goal setting, practicing gratitude, focusing, or prioritizing. Instead, it is just a very cute, pretty planner. If I knew that going into it, I would’ve set my expectations differently. With all the other planners being so unique and robust, I was surprised this one does so well without any extra content. I am not using this planner. The Freedom Journal is an interesting take on journaling because it’s for a specific purpose. Here’s a look at how it’s different. 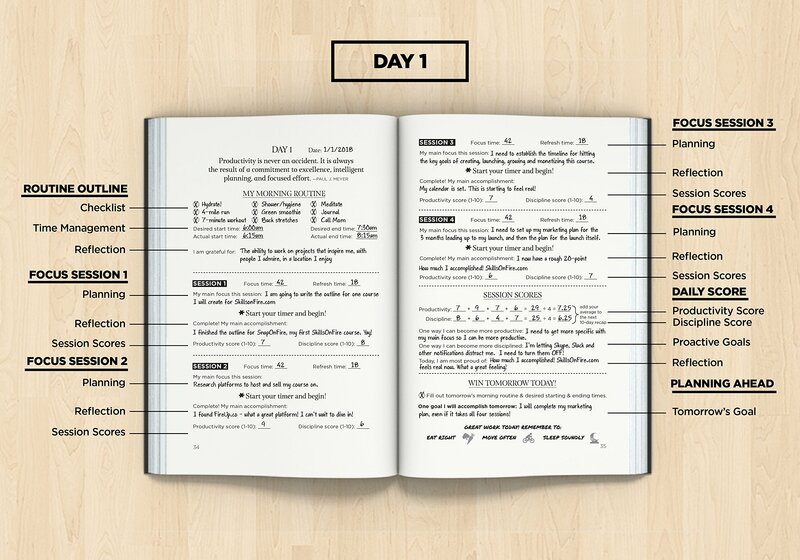 A daily planner to help you accomplish your #1 goal in 100 days. There are several pages in the beginning outlining how to use this planner and examples of each types of pages (I find this to be very helpful). In the beginning of the journal, you write out your #1 SMART goal that you’re going to accomplish in 100 days. Next, you do a “10 Day Sprint” to accomplish mini goals. In each sprint, you outline your 10-day plan, followed by 10 pages for you to fill in what you’re doing each day to move you toward your big goal. Every 25 days, you have a quarterly review, where you review your progress so far. This journal looks like a fancy book you’d check out at the library. It’s nicely designed; however, it does not lay flat and is hard to keep open. There are some quotes and cartoon image designs throughout. By John Lee Dumas, founder of the famous podcast, Entrepreneur On Fire. Anyone who has a specific goal she wants to accomplish. Anyone who wants an accountability partner for goal-setting. Anyone who has the time and will power to commit to a new plan for 100 days. This planner is only good for accomplishing one goal within 100 days. It’s not something you can use for task management or practicing gratitude. The aesthetics of the journal has an “ancient” feel on the outside, and I am not a fan of the images used throughout (feels a bit “salesy”). This planner feels more masculine than the other journals (all of which were either gender neutral or feminine). You can tell the author is a man targeting mostly men. The journal is really useful for what it does – helping you accomplish your #1 goal. It’s something to be used in conjunction with your other journals, not as a stand alone planner. I am using this planner for the next 100 days! I don’t plan to repurchase it for another round, however. The Mastery Journal is lucky number seven! Here’s what I found with this journal. This journal teaches you how to master productivity, discipline, and focus in 100 days. Each day is two pages and has space for you to fill out what you do during your morning routine (including something you’re grateful for), followed by four “sessions” for you to complete your most important tasks or goals for that day. At the end of the two-page spread for the day, you give yourself “session scores”. Finally, you place your biggest goal for tomorrow at the bottom of the page. Every 10 days, the planner has space for a 10 day review where you measure your productivity and evaluate what’s working and what’s not. There are several pages in the beginning outlining how to use this planner and examples of each types of pages (again, this is very helpful). By John Lee Dumas (the guy from #6 above), founder of Entrepreneur On Fire. Anyone who needs to improve her productivity, discipline, and focus. Anyone who wants to get better in these three areas, but doesn’t want to continue using a journal after they’ve accomplished this goal. This isn’t a journal to be used constantly, overtime. It’s a journal to help you become more productive, disciplined, and focused in 100 days. The aesthetics of the journal are just like that of The Freedom Journal. It has an “ancient” feel on the outside, and I am not a fan of the images used throughout (feels a bit “salesy”). It does not lay flat. This journal is similar to the Productivity Planner. It uses similar terms to measure time (the Pomodoro technique), and has quotes at the top of every page. This planner is a good alternative to the Productivity Planner if you want a “100 day challenge” planner instead of a daily planner that you’ll use forever. I like the Productivity Planner better because it’s easier to use, takes less time to complete, lays flat, and is more visually appealing. This is still a great planner – I just happen to prefer the Productivity Planner. I am not using this journal. 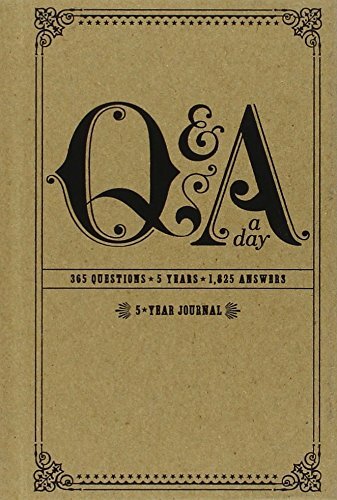 Last, but definitely not least, I reviewed the Q&A A Day journal. A small, hand-pocket journal that has one question prompt for you to answer on every day of the year. Each page has a question at the top, followed by five lined spaces for you to answer the same question for five years in a row. The idea is to see how much your answers change over five years. Each question is very different, which makes every day a little bit unique and entertaining. I didn’t find much background on this other than to say it’s by the company Potter Style. Anyone who wants to have fun with journaling, see how much she grows over time, and likes to learn and try new things. The time commitment is very low for this (maybe takes 1-2 minutes) per day. $9.86 (the price seems to change a lot based on sales but usually in this range). At first I thought it was a mistake I bought it mid year because it’s dated, but that’s not the case because you can start in the middle of it and go forward, then come back around the next year since it’s for five years. It’s not for planning, life tracking, or goal setting – it’s simply a way for you to look back on random days in your life over five years and see how you change. As long as you know that’s the purpose of it (and don’t expect more from it), there’s no downside. Right here on Amazon! And other places, like Anthropology. I think this is a really fun way to make journaling different and interesting. One of those things that I instantly thought “what a good idea”! I love that it opens up with one of my favorite quotes, which makes me think the author had more in mind with this journal. The quote is by Andy Warhol and it reads, “They always say time changes things, but you actually have to change them yourself.” This is something I learned from Andy Stanley – your experiences don’t teach you things, it’s your evaluation of those experiences that teaches you things. So, maybe this journal is a way for people to learn how much they’re reflecting and growing or staying the same. I am using this journal daily. All these planners and journals are popular for a good reason – they’re the best at what they do. I reviewed The Five Minute Journal, The Productivity Planner, The Living Well Spending Less Planner,The Law Of Attraction Planner, The Happy Planner, The Freedom Journal, The Mastery Journal, and the Q&A A Day journal above. You can use each of these separately or some of them together. I am using The Five Minute Journal with the Productivity Planner with the Q&A A Day journal. And for each of these planners, I’ve found the dream pen. I watched YouTube videos about journaling and so many recommended this pen, so I had to give it a try. The Pigma Micron pen is the way to go for journaling because it doesn’t bleed through the pages of your journals and has several options for size (most of which are fine point). I got some for myself and I am using them for all my journals and planners. Highly recommend these. P.s. As this post has grown, people have emailed and commented asking about other journals. P.p.s. If you like one you don’t see, leave a comment and I’ll check it out! I’ve been waiting my whole life for a review like this! I turned to bullet journaling after not being able to find a planner to fit my needs. A lot of the planners you tested seem to get pretty close to the mark. The bullet journal is great because it really can be everything you want it to be, but the downfall is it takes a ton of time to setup. Thanks for sharing! Bullet journaling is so customizable – I love it! This is a very helpful post, thank you! I have the five minute journal, which I enjoy, but it is not really meant to help with productivity. Based on your reviews I think I will try the productivity planner next. Thanks again! 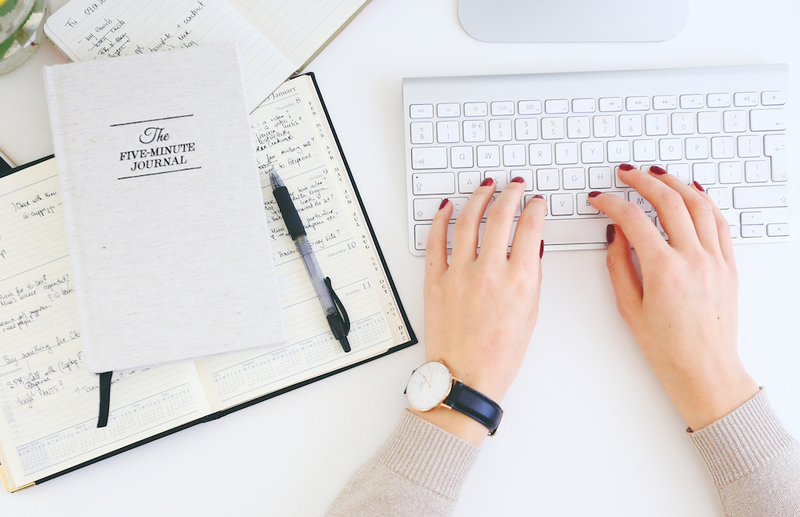 Rachel P recently posted…My new morning routine and how you can create one too! That’s awesome, Rachel! Yes, I love it. Hey Natalie ,lovely post.. Its helping me a lot to decide a planner for my next year. I’ve started using the productivity’s planner. How do you give a score for productivity on that? The directions say to make sure you know what a 10 looks like, so I always do that, then adjust from there. The hard part about doing that is making it a routine. That’s why I have more success with the Five Minute Journal because it’s templated. Hi Natalie! I’m a new subscriber and I just read this post and found it super helpful! In fact, I just purchased the Productivity Planner for work so I’m excited to try it out. Normally, I would print a “sample work plan” that I downloaded off the internet but the papers get lost and it’s very unexciting. Thanks for the recommendation! I was considering joining a 100 day goal setting challenge and glad to see that there is apparently a planner just for that. This journal is perfect for that! Hey, Natalie–Yours is a clear, thorough, helpful review for which I thank you. I took inspiration using the Five Minute Journal, combined it with a separate goal/task manager, and have found discipline and focus as a result. And thanks for the tip on the pen–had some in my art box and hadn’t used them yet! I believe the Happy Planner is actually disc based and not wirebound. The discs actually allow you to add more pages and extras to the planner if I’m not mistaken. You should try the “This is My Era” journal! I just got it and I’m loving it! Thanks! I haven’t heard of it! Is there a reason you left the Michael Hyatt – Full Focus Planner.com out of your evaluation? Do you mind appending your POV if you’ve reviewed it? I bought the first 2 you recommend and the Full Focus Planner anyways. I was wondering the same thing! Any insights Natalie? Gyna – I like the planner! It’s good to use for productivity, but I already have been using the Productivity Planner so I’m not using the Full Focus Planner right now. I do own it though and may try it in the future. Do you use it? I do have the Full Focus Planner. It’s very structured on the pages. I do like it. I’m not sure I would use it with the Productivity Planner – they’re somewhat similar. There is one I like and not seeing here: the Prettysweeeet planner! Do you have any particular recommendations for someone practicing law full time in a private firm? I just bought Michael Hyatt’s Full Focus planner, and I’m eager to get it, but I haven’t seen too many products out there specifically for a lawyers. I feel like our billable hours system makes some of the daily planning a little different from most professions. I don’t personally use or recommend that planner. I’ve tried it and it takes a LOT of time to get the hang of in my opinion. Honestly, for billable hours, I think using the firm’s system for tracking is best. I never planned my day with billables (as in down to .1 or 6 min increments), but this might be something you want to try. I HIGHLY recommend using gCalendar for this type of planning that you’ll need to change and move around a lot – something digital will work better.